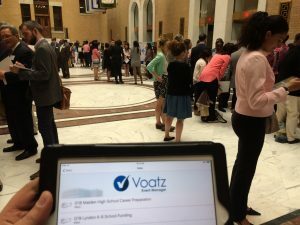 At Generation Citizen’s Spring 2016 Civics Day held on Friday, May 13, 2016 at the Massachusetts State House in Boston, around 150 eminent judges used the Voatz platform to vote via their mobile devices. 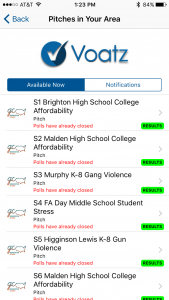 Nearly 350 students from Boston, Malden, Brockton, Arlington, Newton, and Lowell took their first step in becoming lifelong active citizens by presenting their action civics projects from the Generation Citizen semester. 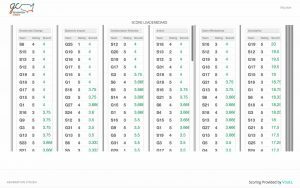 The Voatz Analytics Dashboard was also used for real time scoring. 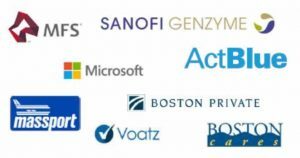 Several prominent organizations were involved in supporting the event.